Lebenswerk S.A. de C.V. y su gran equipo humano se enorgullecen de haber podido colaborar con personas como Usted, que nos han honrado con su preferencia y deseamos que en el futuro próximo, nuestra relación empresarial se vea fortalecida con renovados lazos de amistad y fraternidad, en pro de triunfos continuos y compartidos. Gracias a Usted LW es el mejor medio de publicidad en Puerto Vallarta a través de Tarjetas Postales Gratuitas. Nuestra misión es seguirle ofreciendo a nuestros clientes un medio confiable basado en productos de calidad, diseño de vanguardia, excelente servicio y precio competitivo. Trabajamos con pasión y amor, comprometidos con Puerto Vallarta, con México y con su gente. Sin más por el momento, nos despedimos con la abierta invitación para continuar trabajando conjuntamente, y la plena satisfacción de que lleve a cabo sus propósitos personales y profesionales en los tiempos venideros. Lebenswerk S.A. de C.V. und sein gesamtes Team, möchte sich hiermit für die erfolgreiche Zusammenarbeit mit Ihnen bedanken. Wir hoffen im kommenden Jahr mit vielen Neuerungen, unseren Kunden weiterhin eine einwandfreie und zuverlässige Leistung zu bieten. Wir wünschen ein frohes Weihnachtsfest und einen guten Rutsch in das Jahr 2016! An dieser Stelle verbleiben wir mit vielen freundlichen Grüssen und mit den besten Wünschen für das Neue Jahr. This message is a living testimony to the hard work and collaboration of many people, whom we would like to take this opportunity to thank for their loyalty and dedication to LW. We would particular like to thank all our clients, who have used LW to advertise their products and services, as well as the publicity agencies who have placed their trust in us and have recommended our postcards as an effective advertising media. Our thanks also goes out to all LW distribution outlets. We are equally grateful to our suppliers, who have proven themselves capable of meeting our high quality standards. We extend our warm thanks to all members of the LW working team. For all the people that work here at LW, we aim to represent more than just a job, by supporting the personal and professional development of our employees. Our mission, as always, is to offer our clients a reliable publicity medium based on high-quality products, vanguard designs an excellent services at a competitive prices. We put love and passion into our work and are committed to ‪#‎PuertoVallarta‬, to ‪#‎Mexico‬ and its people. ‪Postcards‬ from ‪Paradise‬. But always a ‪Postcard‬. Many postcards were, and still are, made from photographs. Photographs can depict social history without words. They can show change over time in a certain area. Aerial views can be used to show the urbanization of a town into a city, or any other type of developmental, or demographic change. Photographs can also show the change in the styles of buildings, clothing, and transportation in different societies. Postcards can be an outstanding source of social history, because they show what was popular or seen as important in the area in which the postcard depicts. The photographs on the postcards themselves can show the changes of an area over time. Postcards are a good source of local history and can tell a story of a specific area. The picture postcard was not invented as much as it evolved from other sorts of cards. Playing cards were used as visiting cards during the 18th. century in Europe. They were usually the size of a playing card and had pictures printed on them. Also, there was a space for the name to be printed on the front. Occasionally, messages were written on the back. In 1777, a suggestion was made by a French engraver to publish and send engraved cards through the post for a penny. However, this idea was not well-liked because servants or those who handled the card could read the message. Trade cards were also used in order to advertise a business. Towards the end of the century and into the 19th. century, the style of visiting cards changed. They became smaller, no longer had pictures, and had the names boldly engraved on them. As visiting cards went out of style, more and more people began decorating their writing paper and envelopes. The picture engraved as a heading for the letter would depict the area from where the author was writing. These pictures, which were extremely realistic, evolved into the first postcard. While, postcards show the interesting areas of a certain place, they are also interesting themselves. Pictures can be sent from all over the world to those who have never actually been there. During the Golden Age, postcards were popular because people send a quick “hello” or show a friend or relative where they were staying for a small amount of money. Today postcards are still sent and collected for the same reasons. Postcards can be a means to simply say “Hi.” People often send postcards from vacation or use local postcards as greeting cards. Also, postcards can be used to show someone how nice of a time you are having on your vacation. Before postcards were developed, many tourists would have used a gazetteer. A gazetteer is a geographical dictionary containing any landmarks or specific attractions of the place a person is going. People would tend to look at a gazetteer before or after they went on vacation to see what they were going to see or what they did see. As tourism became a bigger industry, postcards became more popular as a way to show where you have been and where you are going. Postcards also serve as advertising functions. As stated before, a tropical island can be shown on a postcard, and automatically anyone who looks at it wants to go there. Even if one’s vacation was dreary and filled with disappointment, postcards still portray the beauty of the vacation spot. Also it would help to make your tourist dream come true. Postcards can also be used as a means of communication. There are two aspects of communication within a postcard. The front of the postcard contains the picture, which visibly shows where a person was. Most importantly, the back includes the writing. Postcards can be used to send a note to check up on someone or just say hello. Another use of postcards is as a collector’s item. Collecting postcards was a common pastime and still is today. Many people collect postcards to learn more about history. Modern postcards can be compared to one from hundreds of years ago to learn more about lifestyles back then. Postcards portray how people used to dress versus the present. Many people think that postcards are just something that gets sent to friends when they go on vacation. Although that is true, one can see there are a number of other reasons. The most common people who would use postcards today would be historians and postcard collectors. Historians would use postcards to learn more about cultures and lifestyles of the past. For example, comparing the dress of people or the crowded streets of a city. Individuals who collect postcards may do it as a pastime or they may be interested in social history. Postcards are an ideal approach to portray these transformations. Colorization is the process that is used in postcards in which the photograph on the front of the postcard is sent to other countries to enliven the photograph with color, making it more attractive to the consumer. Before postcards were printed in color, greeting cards for certain holidays such as Christmas and Easter were colorized. The first firm for color manufacturing was in Leith, Germany. Called “Lundy”, they were the first ones to start printing business messages in color. Soon, color was what people liked most about postcards. Although the first postcard was published on 1869 in Germany, it was not until 1893 that the photos on the postcards were colorized. The popularity of colorization arose when the postcard act was changed in 1898. It transformed the postcard regulations, the development of postcards and the color was changed to beautify the postcards and make it a more profitable product. After the colorization of postcards the postcards sold in stores became more successful than ever. Publishers often sent their photographs for postcards to India and Italy. These countries specialized in using exotic colors on photographs to catch the eye of the common person. At first this was an ingenious idea, but it caused many problems later. All the postcards were sent to Europe and India because there Lithography was an art. Since the people in India and parts of Europe had never been visit some places showed in an image before, when they received the postcards to be colorized they used their artistic imagination. They used lush colors, although the photos were extravagant one could usually see that the colors were not accurate with the photo. Tourists could see a certain photo of a landmark in a postcard and be disappointed because the colors of the original landmark were completely different from the photo.This shows that in the twentieth century for postcards, people did not care about the authenticity of a photo on a postcard, but only the attractive colors that intrigued the consumer. The photographs show how colorization could make the ordinary look like paradise, even though it was not authentic. The more color that was used the more people were attracted to the place on the photo. Today when postcard collectors and historians are looking at pictures they prefer the photos that are in black and white. They find them more genuine and precise. The colorized postcards are useless when trying to find a historical landmark. In the twentieth century colorized postcards were a fad, but today there is certain nostalgia for postcard that is in black and white. The colors that once seemed remarkable and beautiful are now unreliable and artificial. The dynamics of postcards have evolved greatly over time, changing their overall look. There are some postcards that look much different than those from the time of their creation. The sizes, shapes materials, and the overall set up have all varied over time. Some of these changes affected, while others didn’t. Postcards as you may already know are not very large. They have always been rather small since their creation. Early on in the life span of the postcard there was a standard size widely used in the United States of 3 1⁄2 inches by 5 1⁄2 inches. Almost as large as the majority of modern cards which are approximately 4 inches by 6 inches. Not all postcards have to follow these size restrictions, and there are many exceptions to these rules, but for the most part these are the sizes of postcards. There are many differences on the front and back of the postcards. One thing that was always the same on the back of the postcard was the area for the stamp in the top right hand corner. It remained in this spot throughout all the changes and remains the same to this day. The earlier cards used the entire back of the card only for the address only, reading “This Side For Address Only”. To compensate for this lack of room to write on the back, the majority of these postcards had an area to write on the front, this area was blank could be found on any edge of the card. These cards could be of anything. Some, however, did not have any space to write which left people scribbling over the picture, or writing in the empty sky. As time went on the law restricting writing on the backs of postcards was lifted and a new appearance of the back was introduced. This new appearance had a line splitting the left and right sides so that the right side could be used for the address and the left for the message. After this happened the percent of cards with a space on the front dropped greatly. A rather small number of cards had lines or the address, the non-divided had the least percent, but it seemed that more of the more recent, divided back cards had them. Older postcards had no color when the photo was originally taken. The only way to have color postcards was to ship them overseas and have them colorized. For this reason, many were just left black and white or an odd shade of brown. The ones that did have color seemed rather phony and the color schemes were unrealistic. Many don’t just look unrealistic but they look almost hand drawn. They are of streets and other places of interest such as post office. The more modern cards can be, and are taken in color. There are a few that are black and white, maybe to give a more authentic look. The most recent cards have the best color and have views that were not obtainable at earlier times. This comes with the invention of the helicopter. There are many pictures of the waterfront and other spots that can easily catch a person’s eye. A telephone call today is equivalent to the postcard of the early twentieth century. Postcards were used to convey everyday messages. This occurred not only in large cities, but also in small towns, where people communicated primarily with postcards. A scribbled message was worth a thousand words, as a whisper is worth just as many interpretations. In one such postcard dated 1942, questions arise as to what was really meant by the author’s quick message, “Will see you in about 1 week. Hope your mother is well. Are you satisfied with the way you are treating me?” followed by a “Kind regards to all”? There appears to be evidence of irony in this conversation. We only catch a glimpse into their world, and find ourselves being detectives, trying to uncover the mystery of their lives. Is there a deeper meaning? Perhaps a secret code derived by friends or lovers, to prevent strangers from unrevealing the hidden message within the lines? Yet our first impulse would be to ask who would go through all that trouble to scribble this onto a postcard, when wouldn’t it be more private to speak of such matters in person? However, whoever wrote this message was without the luxury of a telephone. The backs of these sometimes-plain postcards carried messages, whose real meanings may have remained a mystery to all except those whose eyes were meant to read them. Their words ranged from boring, ordinary how-do-you-dos to exciting, life altering news, worth the attention of the maids. However, messages as such were not so common. The usual message asked the recipient how they were, what they have been doing, and then told a brief description of their present life, nothing out of the ordinary, for the most part. Punctuation, grammar, and spelling were paid less attention to, as postcards became more and more popular. People began to favor a less formal message system, rather than one of stiff letter writing, especially by the younger generations, who did not quite know how to follow the strict regulations of the proper form and etiquette of a formal letter. It became acceptable, and almost appropriate to converse using this simple way of communication. “Your photo received ok. We think it´s very good intended to see you before this but will sometime soon.” A quickly scribbled message, not restricted by punctuation or clear thought; an acceptable postcard in 1911. Communication by postcards was not always so simple. When first introduced, the postcard was used more frequently as an advertising tool, rather than a communication device, and followed many strict rules related to size, form, and dynamics. Prior to March 1st 1907, the postal law stated that no words other than the address were to be written on the back of postcards. However, society was much too eager to be restricted by this limitation, and did not dawdle in their want for change. They insisted on using the space intended for the lovely picture on the front, as their letterhead. This appears to answer the question of why any postcard found before 1907 has no split back, and why words are often scribbled across scenic treasures. This also explains why some postcards contain no words, but are simply mailed to a friend, for the benefit of the card, to add to one’s collection. It is sometimes hard to decipher what a person wrote more than hundred years ago. A slang word, which may have been everyday then, is now a complete mystery today. The cursive of today has strayed away from the Old English language of a few hundreds of years ago; however, it was still visible during the early twentieth century, especially how a capital “F” or “J” was strung. A jumble of letters to us formed a word to them, or perhaps an abbreviation, which is no longer used. The telephone and now the internet is the center of our universe, connecting millions of people from all corners of the planet. We communicate, taking this luxury for granted. When the postcard was first introduced, people’s thoughts could be passed from one to another without leaving one’s home. Just as we do, they took this new communication for granted, as theirs words were like the voice we now hear on the other end of the telephone, or even more recently, the pop-up chat box online. When you think of what’s on the back of a postcard one usually thinks of an address and the quick letter one writes to one another. The written messages wrote to one another in the nineteenth and twentieth centuries is both interesting and intriguing, however, most people would not think publishing companies fit these criteria. Soon the United States caught on and publishing companies started to spring up in the U.S. Some of the more famous publishers were The New England News Company, The American Art Postcard Company, The Tichnor Brothers Incorporated, The Hugh C. Leighton Company Manufacturers, and the most recognized The Detroit Publishing Company. Information about publishing companies is extremely helpful to postcard collectors. Publishers can aide in many different things such as finding a particular postcard one desires, dating postcards, and/or find a particular type of cards, an example of this is Christmas cards or a publisher that specialized in the work a of a certain artist. From April 23 to May 5, 2012 takes place the first exhibition of advertising postcards, exposed as a piece of art in “canvas” of 10 x 15 cm. Puerto Vallarta is hosting the first exhibition of an advertising medium as an art, are present with their original campaigns from countries as far as Australia, Portugal, Italy, India, Brazil, among others. Also worthy representatives of companies from around Mexico; such as Cancun, Guadalajara, Tijuana and Puerto Vallarta. The idea of using a free postcard as an advertising vehicle of communication emerged more than a century ago. However, in recent decades took on unusual importance with the creation of companies engaged in a systematic way, design, production and distribution of postcards. What was considered as an alternative form of advertising, now is an “advertising medium” indispensable for the promotion of many products and services. This is demonstrated by the diversity and quality of advertisers who include postcards in their media plan and the proliferation of companies that offer these services. Currently more than 40 countries already have at least one company that is dedicated to this type of advertising that conform IFA (International Freecard Alliance). LW in 9 years has established itself as the leading advertising postcards in Mexico, always striving to stay at the forefront, now taking the initiative to create an exhibition called •Arte Postal Publicitario• that in addition to its visual appeal, is unique by the way it deals with the topic of postcard advertising. LW emerged as an intelligent and creative response that has managed to continue the existence of the postcard as an innovative and changing genre. Young art for a young society, the postcard has become an object of desire for zealous collectors around the world, a true reflection of public passions. We shown postcards from countries as far as India and Australia. The exhibition •Arte Postal Publicitario• was conceived as invaluable testimony to the ways in which man has transformed a pragmatic media of communication into a work of art, raising everyday passions to the status of enduring emotions, to pay homage to the work of national and internationally acclaimed and anonymous artist, who, through the postcard, have propagated the continuance of the paper culture. Those artists have transposed the present into a limited space, offering us a panoramic view of the world, where dreams can become reality. In 2012 Puerto Vallarta will be hosting the first exhibition of an advertising medium as a piece of art, will be present with their original campaigns countries like Australia, Portugal, Italy, India, Brazil, among others, and dignified representatives of companies in Mexico from Cancun, Guadalajara, Tijuana and Puerto Vallarta’s LW who host participants. 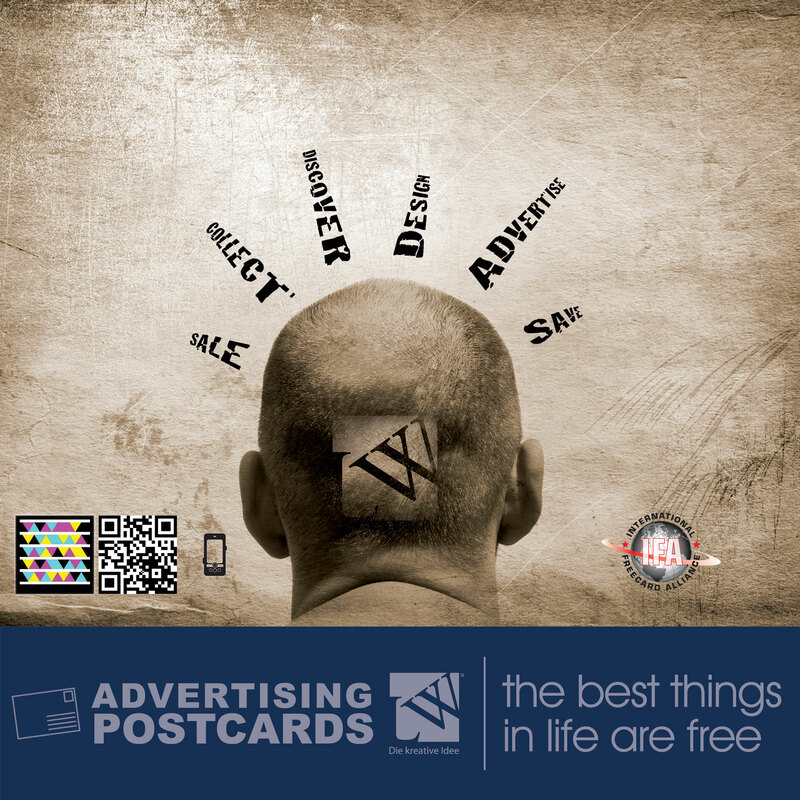 The Advertising Postcard is freely taken by the consumer, resulting in fewer lost impact. In the words of Margarita de Orellana, tells us that the power of fleeting memory of the postcard is also a value-laden statement: “I was there”. But who decides what deserves to appear on a postcard? In fact, in it, we are seeing through other eyes that watched before us the object represented and decided it was worth going around the world and therefore become part of the great collective memory. Join us to learn through a tour of the advertisers’ creativity, the originality of postal advertising campaigns, how they differ from traditional media through innovation in the finishes and kind of paper, message displayed, design and its relationship with other media such as internet, radio and television. The appointment is next Monday 23 April at 19:30 hrs. in Bernice Starr Gallery at Public Library Los Mangos. A good advertising message is a credible promise to the right audience. Our desire is to create ideas disruptive that give our customers greater participation of the future.